You didn’t read the chart. It shows that outside our top line, our forwards are consistently underperforming their roster slot compared to the NHL. I did, my problem was he used numbers instead of names. Considering we had 5 4th line players I'm not surprised. Also idk who mittelstadt is in there, I'd expect with a decent winger he'll shoot up. It's just 1 measure as well. We know we didn't score enough. Getting better players will certainly help. What we're missing: LW2, C2, C5, LD1, RD1. You already know what we're missing. Top defensive talent while Dahlin develops and secondary scoring. LW2: We need secondary scoring. Erod played well in bottom six, keep him there. Sheary was too inconsistent, give him a better chance to find success in the bottom six. Girgensons struggled even in a bottom six role, but his OZstart% was crazy; a different coach will ease up on that. We'll need to acquire a scoring LW. If Skinner leaves, wit only exacerbates the problem. C2: Same story here. Need secondary scoring. MIttelstadt developed, but couldn't provide enough offense to improve the team. 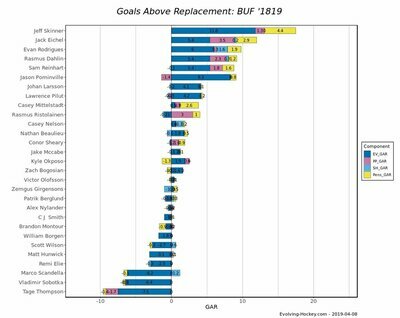 This is a hole left by ROR taht still needs to be filled, and if playoffs next year are the goal, we'll need to acquire a scoring C.
LD1: Dahlin will develop and be amazing. But this season he successfully contributed at the LD2 position against not-top-tier opponents, according to the usage charts. It would be very optimistic to expect Dahlin to shut down top lines well enough and consistently to make playoffs. McCabe ended up against tough competition late in the season, and struggled, but is usually solid against weaker opponents- if he were pushed to LD3, he would undoubtedly perform. RD1: Risto has been bearing a huge workload as far as quality of competition and, by many metrics, has been struggling with it. He needs to see a mixture of easier opponents to be successful. Meanwhile, Montour played with success at the RD2 position but may not be able to carry a team into the playoffs on the top pair. This logjams Bogosian into the 7th defenseman. Also idk who mittelstadt is in there, I'd expect with a decent winger he'll shoot up. Only if Casey improves. Remember he played with Sam for a while as Housley tried to spread out scoring. Free agency is the key for me. If JBot doesn't spend some of that money he saved this year we won't make much quick progress. good analysis, but Jbot is moving on from Pommers, especially since we can’t move on from KO. also it’s time to move from Larsson and Girgensons. They are simply to inconsistent and produce nothing offensively to return any longer. I agree on Bogo. His best slot is 3rd pairing RHD. i dont mind keeping Larsson on the 4th line. Girgensons time has come and gone - time to pull the plug. If Sabres sign Skinner for $8mill Per. What would they have left to spend in FA? Assuming Scandella is moved off the books. my quick calculation that if the Sabres offer slight raises to Erod, Larsson, Ulmark and McCabe and have 2 of Nylander, Smith, Olofsson or Thompson on the opening night roster. They still have about $20mill in cap. They need to go out and spend that money (maybe even over pay to bring in a 2nd line Center). One of Duchene, Hayes or Pavelski need to be on the opening night roster next Oct.
You know cap speculation is one of my favorite things. The Status Quo approach would cost about 72.5 mill. That means Jbot wants to get better by getting younger and better coaching. This means letting Pommers and Girgensons walk. This means demoting Hunwick to the minors which would leave a 1.1 cap hit. It also means re-signing Skinner (8)m McCabe (3.5), Ullmark (1.5), Larsson (1.6) and ERod (1.875) and giving roster spots to Olofsson, Nylander, Thompson and Pilut. I’m predicting bolder moves this summer. I’m going out on the limb and say Risto and Scandella get traded. We acquire a vet D like Martinez and forward JT Miller. Olofsson and Nylander makes the roster with Thomspon traded or starting in the AHL. Sobotka gets lent to a team in the KHL. 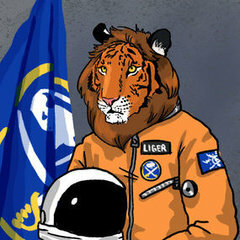 Only RFAs being re-signed are McCabe, Erod and maybe Ullmark if Jbot can’t find a vet goalie he likes. He needs a 3 year window to bring UPL along. However he tenders deals to Larsson and Girgensons to make it easier to trade them for draft picks or depth prospects for the Amerks. Skinner stays for $8 per year once Jbot lays out his plan for next season to him. The only FA we sign is Donskoi which would cost 4 per year. Cost $73.8 with 3.2 dead money for Sobotka and Hodgkin. The Status Quo approach would cost about 72.5 mill. That means Jbot wants to get better by getting younger and better coaching. This means letting Pommers and Girgensons walk. This means demoting Hunwick to the minors which would leave a 1.1 cap hit. It also means re-signing Skinner (8)m McCabe (3.5), Ullmark (1.5),﻿ Larsson (1.6) and ERod (1.875) and giving roster spots to Olofsson, Nylander, Thompson and Pilut. I’m predicting bolder ﻿moves this su﻿mmer. I’m going out on the limb and say Risto and Scandella get traded. We acquire a vet D like Martinez and forward JT Miller. Olofsson and Nylander makes the roster with Thomspon traded or starting in the AHL. Sobotka gets lent to a team in the KHL. The only FA we sign is Donskoi which would cost 4 per yea﻿r. Cap is about $83 Million. I'm taking a bigger swing in the UFA market myself. With Risto it will be interesting what the new coach thinks they can do with him. I could see most thinking they can "fix" him or put in a position to be successful. Re: Bogo. He’s got 1 more year on a heavy salary. Would it not be possible to trade him for a player with equal salary.... but a forward (a long-term piece) with longer term that a team wants to get out from under? Cap hit is negligible.... more about a team that’s going to want some free cap space soon. 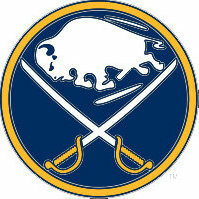 i dont think its necessary, Sabres will have plenty cap space. They could be the one taking on a bad contract if the team was willing to give up a draft pick or prospect. I like that strategy... but the only league I’ve seen it prominently used is the NBA. Except that 1 season for the Vegas Knights expansion... but that seemed to be more due to an extenuating circumstance (outlier). 1a) Also staying: Samson, Olofsson, Pilut, Thompson, Borgen and Carter (although he implies but doesn't say Pilut Thompson and Borgen will be in Buffalo to start next year). I think Borgen and maybe Thompson start next year in Roch. 2) Probably back: Bogosian, Nelson, CJ Smith (imho he'll be back in Roch), Hunwick (I think he's more then likely gone after the draft), McCabe, Erod, Sheary, Ullmark and Wilson. 3) "Up in the Air" - I read this as status unknown: Skinner, Risto, Pominville (I'd place in group 4), Scandella, and Nylander (agree he is consistently inconsistent). 4) Gone: Moulson, Sobotka, O'Regan, Tennyson, One of Larsson or Girgensons (or both) and Elie. 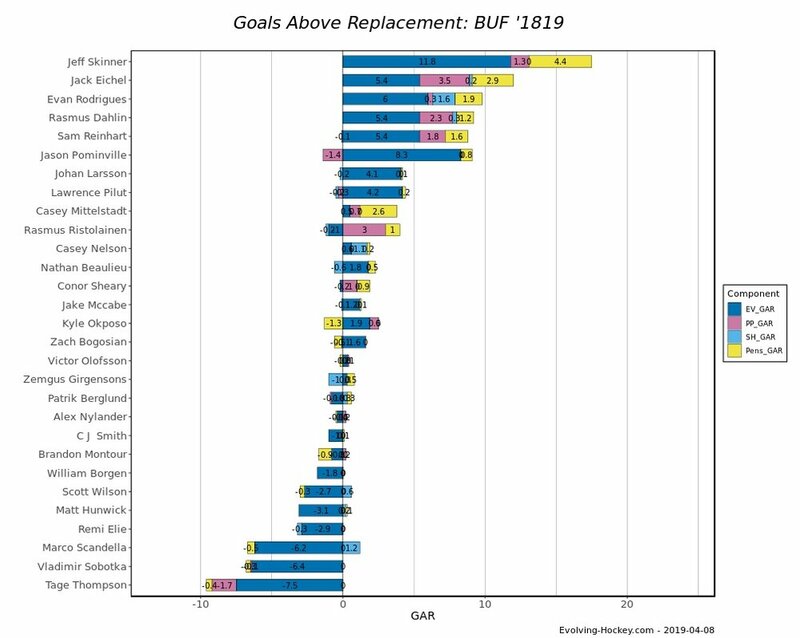 Based on this template, the Sabres will have major holes to fill. Skinner will determine whether they need a first-line left winger. Botterill needs a center to take pressure off Mittelstadt. He’ll need a right winger who can score. The GM may have to remake the fourth line. I'm sorry, but the D and goaltending gave 270 goals. Changes needs to happen there as well. Looks like we can bank on a foreign dman joining us every offseason from now until the end of time. I’m fine with that. Undrafted 20-year-old Arttu Ruotsalainen has been one of the best centres in the entire Liiga. So far, he has six goals and a total of 12 points in the first 11 games. He plays in every situation of Ilves and has recorded a 53.4 Corsi for percentage. He might very well get signed by an NHL organisation next summer. Oskari Laaksonen (Buffalo Sabres’ third-round selection in 2017) has had an excellent start to his season with the team, as he already put up six points in the first 11 games. Laaksonen has good skating and intriguing offensive skill set. He has already shown that he can quarterback a power play and produce as a defenceman. Sabres must be very pleased with Laaksonen’s development so far. I literally read that he was a forward but still made him a defenseman. Reading comprehension.